Harley-Davidson has launched three new models for 2005 including an 120bhp VRSCR Street Rod, a dirt-track Sportster XL 883R and a limited edition 15th Anniversary Fat Boy. The latest member of the V-Rod’s VRSC family offers street custom styling and big grunt. The upright riding position gives it an even more aggressive posture. Harley says tuned suspension means you can lean the Street Rod to 40-degrees. The latest R1 offers 51-degrees by way of comparison. 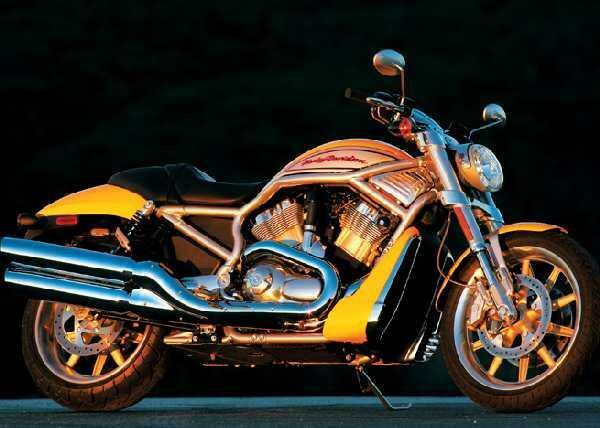 Read more about the Street Rod in MCN - out on January 26, 2005 - see why its upside-down forks, Brembo brakes,120bhp engine and cut price make this the bike Harley thinks will tempt more UK buyers than ever before. The 2005 Sportster XL 883R has a blacked-out Evolution powertrain and racing-inspired 883R graphics on the ‘peanut’ tank, staggered ‘shorty’ dual exhaust system and twinl front discs. Other blacked-out components include fork lowers, headlight cover, handlebars, air cleaner cover and rear shock springs. The limited edition 15th Anniversary FLSTFI Fat Boy has an extra helping of chrome, and style to stand out even from the Fat Boy crowd. The Fat Boy’s signature solid disc wheels have been chromed and the two colour options – Vivid Black and Brilliant Silver – are complemented by a matched paint scheme on its counterbalanced V-Twin motor. It has a 24K gold-plated tank emblem, Badlander-inspired seat, anniversary edition air cleaner and timing covers and bespoke ignition switch plate make it a stand-out Fat Boy. For prices and availability contact Harley dealers.